The Sola story is made up of 12,000 individual stories... This means that when we ask our community what having a salon studio at Sola means to them, we get thousands of different answers. For some, Sola represents freedom and control. For others, it's about opportunity and living that boss life. The reasons to own your salon, and the feeling you get inside your studio space, are different for everyone. And that’s the beauty of Sola! Roxanne Muir I feel limitless in #MySola. I have the ability to design my career the way I want. There are so many options and so many doors to open. When you have a Sola you have the control to do any project you want. It's all up to you! In most salons, you’re limited to the hours available for you to work. For example, a photographer friend of mine was in town and I had the freedom to say yes come to my studio! I love having full control over when and how I use my space. Ashley Lantz #MySola is my livelihood. A year ago, my #MySola statement was “#MySola is my creative space.” It made me feel confident in my craft. Then I found out I was pregnant and my studio took on a different meaning. Being my own boss has made all of the planning so effortless and I truly wouldn’t be able to plan for our new life so stress-free if it weren’t for my Sola. The definition of livelihood is a means of securing the necessities of life. When my husband and I talk about how we’ll handle life after our daughter gets here, my response is always, “I’m so glad I control my own schedule.” When I think back to my life managing a traditional style salon, I realize that none of our plans for us to work around each other’s schedules and control my own hours would have been accessible. Now, I will be able to spend as much time as I want at home without it drastically affecting my income, client retention, or home life. I feel unbelievably secure. Rona Bunch I feel jubilant in #MySola. In my studio, having the opportunity to promote happiness, triumph, gladness, and joy are what it’s all about. We all could use more of all of those in our daily lives. We never know what is going on in someone’s world so having the chance to make a positive difference in a co-worker’s or client’s life can make all the difference in their world. Becoming a hairstylist has so many other job descriptions than just being a hairstylist. We also become a therapist, lawyer, doctor, teacher and, most definitely, an extended part of our clients’ families. Kenya Kirk #MySola is my community. Most people think you need a 10,000 square salon to make an impact on the world, but I’ve learned how to do it right in my studio. In my Sola, we offer our clients a chance to give back by asking them to bring in homecare hair products that didn’t work for their hair, and we donate them to the local foster or adoption agencies for underprivileged kids to have variety with their hair care options. Julie Nguyen #MySola is my opportunity. I am in control of my own path as a multi-passionate entrepreneur. Being my own boss at Sola gives me a great platform to explore different creative avenues on my own terms. When I first looked into getting my own studio, I took a tour and immediately started to see a clearer vision of the path that I was about to embark on as an entrepreneur. The way Sola supports you from day one really opens up your eyes to new creative paths. Joey Figueiredo #MySola is my freedom. Being able to create my own brand and space for the clients I want to attract and service is freedom. Creating the career I want as a stylist and having no limits to try different areas in this industry is true freedom. When I was in a traditional salon, I wanted to try different things to build my clientele, but I was limited because it took time out of the salon. Coming to Sola allowed me to call the shots and create my own destiny in my career. It allowed me to be able to explore different areas of the industry that I wouldn't have been allowed to try. Freedom for me is not setting limits and taking risks when you feel you are ready. JayR Mallari I feel legendary in #MySola. I can control my environment from the way it smells to how my client feels when leaving my studio. The space has given me the opportunity to create a new wave of barbering without anyone looking over my shoulder. Because of this, I feel as if I helped open the door to barbers who feel stuck in their current situation, or barbers who want to be an owner without managing people. 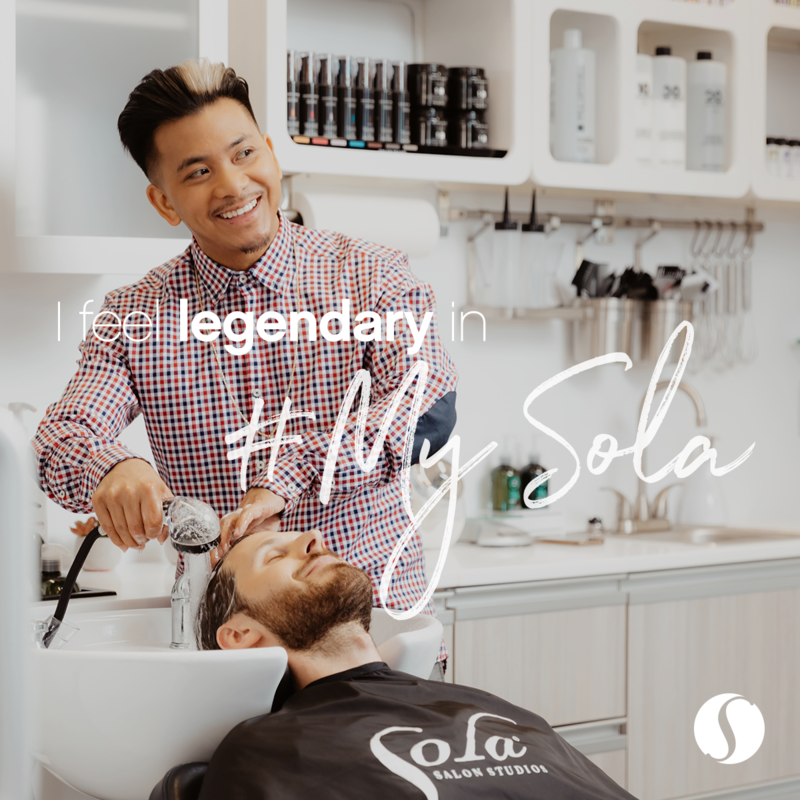 I feel legendary because Sola has helped me succeed during this part of my barbering journey, which will now influence barbers to take this route in becoming their own boss. When my peers are motivated and eager to learn, it makes my job 10 times easier, especially as a leader. My goal is to leave a legacy by being legendary. Sade Wiliams I feel confident in #MySola. My Sola allows me to focus on my own business goals and achievements. I no longer have to compete with other stylists or feel insecure about my work. I am eager, willing and happy to go to work. My Sola anniversary always makes me realize how far I have come. Going into my fourth year at Sola, my confidence in being an entrepreneur has skyrocketed and I know that I am able to create an everlasting brand. Christopher Matthew #MySola is my soapbox. All of my guests have one overriding reason for coming to Dillinger's – it's just different. It is different because unlike large shops with many personalities, we can have in-depth, intelligent discussions around a range of topics. It is just the right size to be a sounding board of sorts. I can give and solicit advice. I can test ideas, products, and processes and get immediate feedback directly from the consumer. My Sola is everything it is because of everything it's not. Kayla Valerio I feel magical in #MySola. Sue Scott I feel elated in #MySola. Kelsey Morris #MySola is MY BRAND, the way I want it. I love that Sola allows us to have individual identities while backing us with support from a community that cares. This is the stylist I want to be... a #GirlBoss who knows her brand and is able to express that freely. When moving to my Sola, I took great pride in identifying what my brand would look like and how I wanted my clients to feel when they come in. I'll never forget the first time my best friend came to my salon. She cried when she walked in and said, "This is the beginning of something great. I can feel it." She was right! Alex Sylvester I feel courageous in #MySola. The moment I found out about Sola was when my previous boss let me know that she was shutting the doors for good to the current salon I was in. She told me about Sola and how I was ready to take more ownership for what I have in the business. She had nothing but confidence that I was ready to not just lead but own. She told me, “You are the one person I know that would be courageous enough to try something new like Sola. You have the ability to do more in there besides owning a little spot. You can rock it and make the world know about it.” Well, who would have thought it actually came true. That’s why I feel courageous in my Sola. 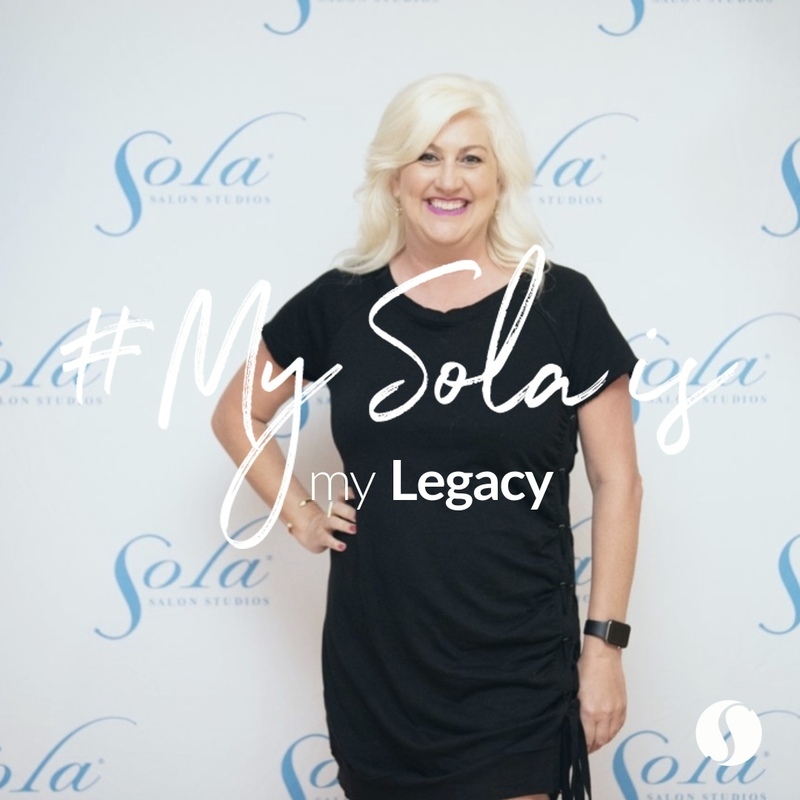 Kim Bennett #MySola is my legacy. Becoming the first Sola stylist 15 years ago is a badge of honor I wear proudly. Sola has given me limitless opportunities for my career and a platform to create my own story. The day I met the co-founders and signed my lease, I knew I was joining a brand that had endless possibilities for me and an ever-growing community. 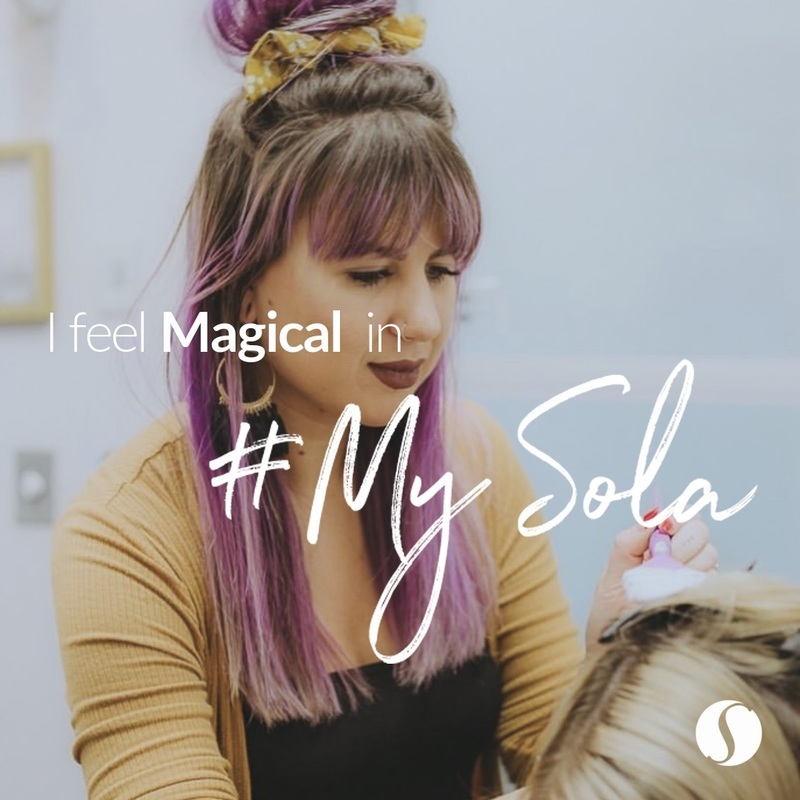 What does #MySola mean to you? Create your own image and share it on Instagram with the hashtag #MySola for the chance to win one of many SUR-PRIZES!